Eiger, Mönch and Jungfrau – these three peaks of the Alps dominate the panorama of the Bernese highland. Although the Eiger (3970m) is not as high as the Mönch (4107m) and Jungfrau (4158m), but due to the notorious Eiger north face the mountain became spotlighted in the public interest. In the 30ies it was many mountain climbers` doom. The first human being climbing the Eiger peak was from Ireland. In the year of 1858 Charles Barrington managed this crazy tour supported by two Swiss mountain guides. Coming from the western flank they arrived at the Eiger peak safe and sound. A little bit later, alpinists tried to climb the mountain from other sides and constantly looked for new routes for climbing up. Matterhorn, Mont Blanc and Eiger have one speciality in common: difficult north walls. In 1786 the first mountain climbers climb up the peak of Mont Blanc, in 1858 the Eiger and in 1865 the Matterhorn. But for the alpinists it has been a hard nut to crack the north walls for a long time. The wall in the Mont Blanc massif called Grandes Jorasses is climbed for the fist time in 1935. The north face of the Matterhorn was managed to be climbed up already a few years before. But for a long time the Eiger north face has been a malicious trap for mountain climbers. In the 1930ies the first teams tried to climb up the north face of the Eiger – and all met their end in the rocks. The massif achieved a world-wide, but undoubtedly negative reputation. It goes without saying that the media were on the spot when a duo of mountain climbers started to climb up the wall again in the summer of 1938. 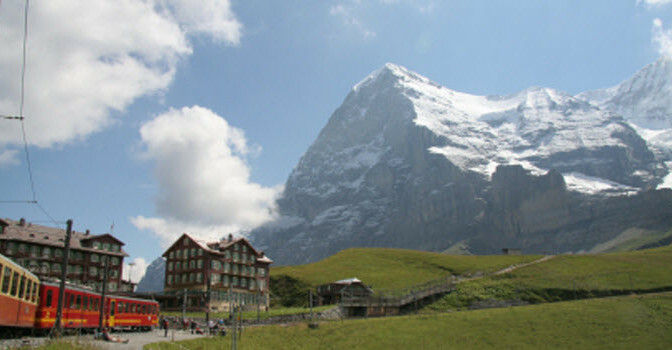 You have a perfect view of the Eiger and its notorious north face from the Kleine Scheidegg and you can watch the alpinists climbing up the mountain. Heckmair and Vörg, the two daring German climbers, meet the Austrian Hinrich Harrer and its companion on their way. Nowadays, the classical route through the Eiger north face is called Heckmair-route. Since then the mountain Eiger North Face has not lost anything of its fascination and now as ever remains dangerous. Again and again expeditions start upwards, again and again mountain climbers suffer. Who wants to remain undamaged and nevertheless to gain unforgettable expressions from Eiger, Mönch and Jungfrau, walks along the Eiger trail. The Wengernalpbahn takes its passengers from Lauterbrunnen or Grindelwald to the Kleinen Scheidegg (2061m).The Jungfraubahn goes across the Eiger massif to the station of Eiger glacier. A hiking trail leads close to the Eiger north face, the rocks mount up steeply next to the wanderers.